Find free classified ads for Vehicles for sale and to buy in Medway. Shown below are classifieds for Vehicles. Please use search box above to find other items in Vehicles Medway or look at the Medway for neighboring places in the locality. Premier Houseboats are pleased to present Flying Moon, a charming static houseboat on two levels, offering an amazing amount of living space for her size, on a secure residential mooring. Flying Moon offers a surprising amount of space given her size, because of this mooring fees are low making her very economical to live in. Premier Houseboats are pleased to present Debralee, a converted tank barge which is now a characterful home, in an excellent position and offering superb views. Debralee has been well converted to provide great space, excellent headroom and good use of every area. You enter into the wheelhouse area, which is now a fitted kitchen. Premier Houseboats are pleased to present Toad Hall, a well presented static houseboat ready to move into, offering good living space at an affordable price. Toad Hall has been recently refurbished inside, and the exterior has also been painted. As well as a spacious and light interior, there is also plenty of usable outside space to enjoy the peaceful surroundings. Premier Houseboats are pleased to present this Humber keel on a residential mooring with cruising capabilities. Ellen Elizabeth was originally purchased and brought to the areal from the Wandsworth Youth River Club in 2003, where it had been used as a training, adventure and leisure pursuit vessel. It comfortably accommodated up to 12 children plus crew, and between 1985 and 2003 it has carried over 10000 children, and obviously from a safety point of view was maintained to strict high standards. Premier Houseboats are pleased to present Cornelis, a beautiful dutch barge, lovingly converted and in full cruising condition. Cornelius had been converted to create comfortable living, with space throughout utilised to its full potential. Cornelis has been converted and finished to an extremely high standard, with great thought given to make the most of the space available, without impacting on her cruising ability. Premier Houseboats are pleased to present William Ryan, thought to be the oldest Thames tug still in existance, now stripped out and ready to be converted to a characterful houseboat. All the hard work has been done, the engines have been removed, and the boat has been taken back to the steel, and is now ready for conversion. Premier Houseboats are pleased to present Carolinar, a well presented large family home, offering luxury and space in stunning surroundings. Great thought has been given to the design of the conversion, the space provided and the finish. The whole boat has a fantastic feeling of light, with consideration also given to the use, and quality, of the outside space. Premier Houseboats are pleased to present Lune, a recently converted static houseboat offering space, character and everything you would want as an affordable family home. Lune has been converted over three levels to create a beautiful and spacious family home that also makes the most of the external space so you can enjoy some stunning views. Premier Houseboats are pleased to present Humber mariner, an ex tanker barge now on a secure residential mooring and ready to convert to a large, character home. Built by the Yorkshire Dry Dock Co in 1963, this boat has 6 tanks of 70 cubic metres each, which can be opened up to create an incredible living space, and also has the ability to create further living space on deck. 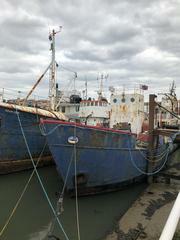 Premier Houseboats are pleased to present this tug boat, ready for conversion with all engine taken out and now on a secure residential mooring on the River Medway in Kent. 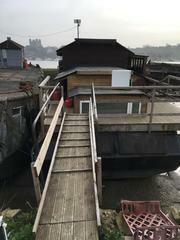 This tug, which came out of service in 2014, provides an amazing amount of space to convert, over three levels, and will be a stunning large family home. Premier Houseboats are pleased to present the Duchess M, until 2016 used as a Tilbury/Gravesend ferry, and now on a residential mooring and ready to convert to a superb character cruising home. The Duchess M is structurally and mechanically sound, and had a new engine in 2016. Given her role she was maintained to a high standard, and provides lots of space to create a comfortable home. Premier Houseboats are pleased to present Aquatic, which has been converted to create a large family home with character and space, including the potential for a self contained flat on the upper level. The price of Aquatic has been drastically reduced as an alternative mooring will need to be found for her. Premier Houseboats are pleased to present Elephant, a River Lee Lighter on a secure residential mooring in Kent, ready to convert and create the houseboat of your dreams. Finding an empty barge ready to convert on a residential mooring is a rare opportunity, and therefore Elephant must be seen to be appreciated. Premier Houseboats are pleased to present Sea Challenge, a tug that has been thoughtfully converted to an extremely high level to create a large and characterful family home. Sea Challenge has undergone a remarkable transformation, the thought and attention to detail has created something very special indeed. Filande, a classic motor yacht, lovingly refitted throughout over the last six years, is now offered for sale. Filande can be used as a static home, a cruising home, or both, and is fully equipped for all eventualities. Filande was dry docked in 2017 and had a full survey which is available upon request, with all recommended work carried out. Premier Houseboats are pleased to present Rana, a part converted tug providing plenty of comfortable and spacious accommodation, and the opportunity to increase living space and put your own mark on this character home. The conversion work completed thus far has provided well thought out and spacious living areas, without losing the character and shape of the boat. Premier Houseboats are pleased to present Marmite, an unusual and quirky static houseboat offering comfortable living space and beautiful views across the river Medway towards Rochester castle. Marmite's somewhat unusual decor, and unique layout, belie the fact that she is a good sized two bedroom home, with good outside space and plenty of opportunity to put your own mark on this floating home. Premier Houseboats are pleased to present Kaipaa, a sea going Ice Breaker tug originally built on the river Siene in 1948, before being taken to Finland in 1973 and completely rebuilt. Kaipaa is unusual in that the engine room is intact and in full working order, but she still has plenty of accommodation space to live comfortably afloat. Premier Houseboats are pleased to present Curlew, a 1974 Fairline Fury in good condition both structurally and mechanically, and available to use as a leisure boat, holiday or weekend home, or full time residential home. Curlew has been well maintained by her current owner and offers surprising space as well as being easy to manoeuvre, be it coastal or inland waterway cruising. 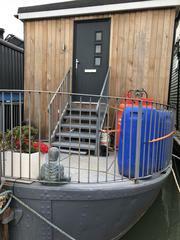 Premier Houseboats are pleased to present Lord Nelson, an ex lightship that has been converted to create an excellent family home, with great scope to create further accommodation internally. Lord Nelson is extremely spacious internally, with many original features as well as modern comforts, and externally has excellent deck space on two levels. Premier Houseboats are pleased to present The Flying Dutchman, originally a German naval customs patrol vessel, converted to a spacious and luxurious cruising home. This is a rare opportunity to purchase such a classic but stylish cruising home, it's size means that unlike a barge you do not forsake accommodation space for an engine room. Premier Houseboats are pleased to present the River Lee 2, a stunning and contemporary houseboat, fitted out to an extremely high level both internally and externally, offering amazing light and airy living space, and excellent external space. Great thought was put into the creation of this modern houseboat, with every effort made to ensure an incredible standard of luxury throughout. Premier Houseboats are pleased to present Mary Brent, a luxurious and contemporary houseboat, with spacious accommodation and excellent outside space. Mary Brent is extremely well presented throughout, with the layout providing comfortable living space and a good outside decked area, making her a perfect size for a family home. Premier Houseboats are pleased to present Sea Dragon, an ex oil rig lifeboat now cleverly converted to a houseboat, currently on the hard standing at Ramsgate marina, with the possibility of a mooring in the marina. Sea Dragon has been thoughtfully converted to maximise the space available whilst still retaining full cruising capabilities. Premier Houseboats are pleased to present Triton, a Mervyn Street workboat that is now part converted to create extra internal space, and will be ideal as a work boat or weekend/leisure boat. 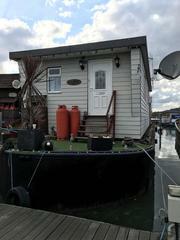 There's a good sized wheelhouse offering panoramic views, ideal for when out cruising or fishing. Downstairs there is a sleeping area, seating area that can also convert to a double berth, and a plumbed in sink. Premier Houseboats are pleased to present this good sized fibre glass pontoon, built in 2017 it is now ready to be used as a houseboat base or commercially. The structure is timber framed and filled with solid closed cell polystyrene. It is finished with 18 mm marine ply and seven layers of fibre glass. Premier Houseboats are pleased to present Kalimera S, a dream conversion opportunity already part converted and offering plenty of comfortable living space whilst completing the project. Kalimera S offers incredible space both internally and externally, whilst still retaining the character of a ship. Accommodation. Premier Houseboats are pleased to present Two's Wild, an extremely well maintained Mirage 29, fully equipped and ready to sail. Two's Wild offers surprising space, with a double and two single berths in the main saloon, together with a V berth in a separate cabin. There is a cosy galley with sink, fridge and gas oven and hob, and also a separate toilet and shower compartment. Premier Houseboats are pleased to present Jorja, a unique conversion of an American army tug, a stunning example of space and quality throughout. Jorja's conversion has been completed over seven years, with great thought given to both layout and quality of finish, the end project being a " one off " home with space, character and history. Premier Houseboats are pleased to present Blue sands, a converted concrete barge offering excellent space both internally and externally, and superb views across the river Medway to Rochester castle. Blue Sands offers good living space, with the potential to create more using the large open deck, and make the most of the stunning views. United Kingdom free classified ads for Vehicles, Medway, Vehicles free ads Medway, Vehicles for sale Medway, Vehicles to buy in Medway. This page is a listing of classified ads for Vehicles category in Medway. This section includes classifieds for sale and to buy in Medway. Vehicles Medway ads Medway, Vehicles classifieds Medway, Vehicles free ads Medway, ads for sale Medway, ads to buy Medway, FREEADS in UK. 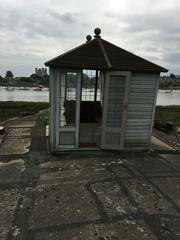 Find here ads for sale, to buy and rent in Medway. Goods for sale in Medway, vehicles for sale in Medway, Medway real estate for sale, Medway property for sale, property for rent in Medway, business ads in Medway, Medway business classifieds, services in Medway, Medway services ads, jobs in Medway, pets for sale in Medway, Medway dating, Medway cars for sale.